The bathroom is the place where you spend most of your time in after the bedroom and living room. Given its importance in your life, it is therefore worthy attention. How you do this, is by making sure you have the best bathroom equipment for maximum comfort. It has been proven that taking a bath refreshes and relaxes your whole body. A hot shower will relieve stress. Having said that, all you need is a great showerhead to achieve your happiness. The Hydroluxe full chrome set of shower heads is perfect for people with back and neck pains. Both shower heads can be used together to stream the back and neck at the same time as therapy. 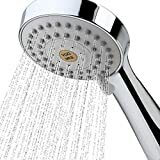 For homes with different water pressures, the showerhead can be adjusted to any of the five modes of stay warm mist, power rain, massage, economy rain or a pause whichever suits your needs. Besides giving you a choice of 24 different water flow patterns, it sells at an affordable price. It is easy to install and is all you need for memorable shower experiences. 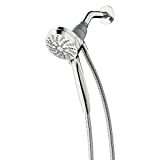 A good shower head is known for its quality and durability. The ShowerMaxx offers you both as it is made of high-quality ABS material. Apart from the high pressure achieved by removing the flow restrictor, massage and water saver modes, six spray settings are possible. And they are a rainfall mode, a circular massage, a power massage, a rainfall combined with circular massage, a rainfall with power massage, and a water saver or trickle mode. The shower also features a 6 feet long hose allowing showering at any angle and a self-cleaning nozzle. When you buy the ShowerMaxx you experience a spa-like shower at an affordable price. This a high-pressure showe head for lovers of great water impact against their bodies. The high pressure is strong enough to relieve muscle pain and the shower is therefore therapeutic in a way. It is simple, reliable and easy to use for anyone due to its lightweight nature and less complicated installation. The YOO.MEE is cost friendly and the order comes with cost-free water regulator, two hose gaskets, and Teflon tape. Which is better than having a shower that sells cheaply but gives you similar satisfaction like the expensive ones. The Delta does exactly that. It has multiple spray settings that include a Full Body spray, a Fast Massage spray, a Full Spray with Massage, a Drenching spray, a Soft Drench with Full spray, and a Soft Rain spray. The pause feature is for reducing water to a trickle giving breaks between showers for lathering or shaving while maintaining the preset water temperatures. The flow is consistent and the long hose affords to shower at any angle. The AquaBliss is a high-performance showerhead designed to perform best in both low and high water pressures. It is quick to install and has an ergonomic handle for easy holding and gripping. It is perfect when using a shower stool or bench, washing pets, and bathing small children, and the hose is long enough with 360 degrees rotating ends to help you achieve that. 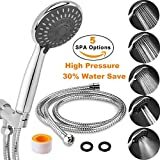 The showerhead is durable, lightweight and comes with 6 spray setting including saturating mist, drenching rainfall and an invigorating massage to give you maximum satisfaction when taking bath. 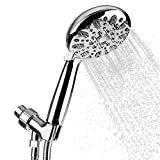 This showerhead besides being relatively cheap is made of high-quality ABS material with a Chrome finish making it durable and giving the impression of a high-end shower head. The finger grippers and a lightweight provide perfect control when washing kids, pets or assisted showering. The showerhead boasts of 8 lavish spray settings that range from water saving mode to power massage mode. When you purchase this item, it comes with an adjustable arm mount, a long enough hose, and a sealant tape to help reach the unreachable parts of your body. The Moen Magnetix is Eco-friendly meaning it complies with WaterSense standards as it conserves water while giving the best performance. It also meets the American with Disability Act specifications hence suitable for everyone including those with disabilities and showering from a bath bench or washing kids and pets. 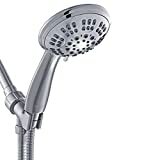 The showerhead comes with a magnetic docking system that allows for detachment of the head from the mount and can be replaced easily as well. The water flow is nice, pressure excellent, and it has six spray settings. Besides durability and lightweight, it is also affordable. The ShowerMaxx shower head has an extra-long hose to reach every part of the bathroom and body hence suitable for bathing kids and pets. High-pressure water is therapeutic, and the showerhead gives you just that to help relieve muscle pain. It features a self-cleaning nozzle, a flow restrictor to be adjusted to desired levels and a sand filter. Just to mention, after purchasing, it is easy to install and experience a spa-bath feel from the six different adjustable spray settings. The long warranty gives you peace of mind as you use it. When you purchase the Vida Algeria, you will be stuck in the bathroom for all the good reasons. Aside from looking great, it has a nice flow and the flow restrictor can be adjusted to achieve the best pressure for maximum satisfaction. Also, the heavy water flow is great when rinsing thick and long hair. The five water flow choices are amazing including the massage mode. It comes with a hose that extends to over 7 feet and a stay-put holder as well as a solid clip to prevent unwanted spray rotations. A free Teflon tape is offered upon purchase together with an easy to follow installation manual. Basically, it installs within minutes. The Aoche is a powerful handheld showerhead with five luxurious functions for a pleasant bathing experience. This shower head gives you a natural spa-feeling from the comfort of your home. The long hose together with a large size shower head and high pressure makes it favorable for use indoors and outdoors. It is thus suitable for kids, adults, and pets. The high water pressure is great for quick rinsing of thick and long hair. When it comes to cleaning and installing, the Aoche is the easiest just like it is the cheapest. It saves up to 50% of water and adheres to environmental regulations. Not to forget, the message mode, will have your muscles kneaded for pain relief and relaxation. The human brain strives for comfort all the time. And that is why we all take showers together with our pets to feel good and refresh ourselves. However, a great shower that brings therapeutic feeling requires investing in the best bathroom equipment. Still, it does not have to be expensive. 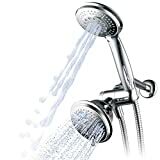 The top 10 best handheld showerheads in 2018 review above, gives an idea of some of the best bathroom equipment on the market selling at a pocket-friendly price. Since anyone can afford them, why don’t you go for one and begin a journey of comfort and satisfaction?